Last week, my wife’s dear friend and her husband welcomed their first child into the world. It was not an easy pregnancy, and so the arrival of a healthy baby brought as much relief as joy. This new arrival made me reflect back when my daughter Avery was first born. I remember the difficult search for a pediatrician. We were so unsure about what qualities to look for and who would be the best fit. Even after making our selection, we were still filled with trepidation. Avery arrived and was a very healthy baby. The pediatrician came and saw her at the hospital, and then later that week we went to the office. I remember my wife coming home and telling me that she really felt good about our selection because he asked as much about her as he did Avery. The doctor explained that if the mother wasn’t doing well then it would be awfully difficult for her to provide adequate care to the child. That theory was such a simple idea, but it was so revelatory to me. It just made such complete sense. The mother was going to be introducing this child to the world, providing nourishment, guidance and security – of course it was important that she was feeling nourished and supported herself. I think this is a concept that is undisputable, yet for some reason doesn’t carry over when considering the next group of people that are responsible for our children’s growth; their teachers. Reformers like to say they are all about the child and that they only support policies for children and not teachers; somehow the implication being that teacher’s concerns are just adults protecting their self interests over children’s needs. But if the teacher responsible for the child is getting paid so little that they have to take a second job, are they truly able to give everything to meet the child’s needs? If an teacher is so under the gun to produce high test scores or lose their livelihood, aren’t the test results naturally going to come before students needs? A child is not a singular entity independent of outside forces but is in fact part of a larger system with a multitude of influences. If you were ask teachers how they would address these influences, you would find their answers to be child-centric in addition to being fair to their own occupation as teachers. In other words, teachers want to be treated fairly and respectfully, but more than anything they want to be free to teach their students and meet their students needs. They are also the best suited to address those needs because they are front and center everyday. I always say that trying to create education policy without talking to teachers is like trying to run a fine dining place without talking to waiters. It can be done, but not effectively. When raising my children, nobody has a better view of their needs than I do and I don’t only take into account things that will have a direct impact on them. Instead, I try to take in the whole picture and how it’s all connected. For example, I try to run on a regular basis. I don’t do that because I enjoy running, but because I know that if I’m not healthy, I will not be able to fully engage with my children thus hindering their development. Not to mention that if I drop dead of a heart attack it would be severely detrimental to them. So taking care of myself means I will be better equipped to take care of my children. My wife and I should probably go on a date night more than once a year. I know that means we’d be diverting funds away from directly supporting our children, but if we are not connecting and taking the time to strengthen our relationship and work on our own personal development, we are potentially having a negative impact on our children. Thus hindering their full development. So taking care of the relationship between my wife and I means we will be better equipped to take care of our children. Or try this alternate approach: go to your spouse and tell them from now on, all decisions on your children will be handled by your mother. After all, she’s their grandma. She loves them, has their best interests at heart, and she’s an expert at raising children, and never mind that it’s been years since she was around children daily, your input won’t be needed. Yeah, try that and let me know how that works out for you. Because this wouldn’t work out best for your children at all. You are the experts when it comes to your children and by proxy, teachers are the experts when it comes to their schooling; not legislators and not private interests. I’m not saying anything revolutionary here, yet we fail to apply these principles to how we deal with the people we all agree are essential to the development of our children. We create standards without ever having a single classroom teacher be involved in the initial development. We promise teachers raises and then play shell games. We say collaboration is essential and then fail to provide adequate planning time. We hear all about education issues on television, yet teachers are rarely asked to comment. We say we respect teachers, but the mainstream media continues to vilify them. There are those, with whom I agree, that believe all of these things are intentional. That reformers seek to quantify and rank everything, creating a system where a truly gifted teacher is not a requirement or even desired. What’s needed are essentially, as Rev. Richard Sindall so eloquently states, trainers. People who can follow directions, not question the prescribed directions, and in effect, provide big business with their future employees rather then focus on what children really need. Why else would we continue to de-emphasize quality training and continue to fund an organization that is basically a temp agency? Despite recent studies that show Teach For America as being no more effective and in some cases detrimental to child learning, we continue to fund them with corporate and state donations. Reformers look at these results and default to the old straw men arguments about teacher’s unions and only protecting adult interests. Funny though, TFA brings in a bajillion dollars a year, so obviously propping them up is protecting some adults interests. In fact, I’d say that an organization that has over $400 million in net assets has quite a few adult interests at heart. Imagine if those funds went to teachers who actually want to make teaching a career instead of a stepping stone to something else. In addition to turning to temp agencies to staff positions that we all agree are vital to our children, we have also created an evaluation system that has repeatedly been shown as ineffective. The teacher’s who are assigned a high value-added score are the one’s who deliver high test scores, and this is how reformers define a quality teacher. This is despite evidence that shows no real correlation between high test scores and success in life. Don’t get me wrong, I’m not downplaying the importance of reading and mathematics to future success, but they are not a be-all or an end-all. Last night as I was trying to watch TV, my wife brought up what I thought was a brilliant plan – to utilize the art and music to hook middle school English Learners she works with into lessons, and as a result of this, increase their reading and writing scores. Reformers argue for focusing almost exclusively on measurable skills. While the arts are not producers of measurable results, they certainly can be highly effective at engaging students. An engaged student is more receptive to learning. Imagine that, we flipped the horse and the cart, therefor providing a more robust education. This is evidence of why we need to push back against the concept of the status quo and realize that there are dedicated teachers everyday searching for new ways to reach children. Somehow there is this misconception that if we took away high stakes testing and the threat of accountability, teachers wouldn’t push children to learn as much and children would fall behind. I have never seen evidence of this. Therefore instead of perpetrating this myth, we need to reject it and find new ways to support our teachers. Talking to them would be a good place to start. My family has got an interesting dynamic. My kids tend to be a little more smart-mouthed than they should be because we encourage them to question. They tend to take a few more risks because we’ve empowered them to practice setting their own boundaries at an early age. Both my wife and I work, so dinner is rarely before seven o’clock and the kids seldom get to bed before 9. There is a lot of “expert” parental advice that we don’t actually follow. When it comes to my children, I’ve been known to be inconsistent with my messages at times, and on occasion, have resorted to bribery. The thing is, knock on wood, my kids are healthy, happy, and intellectually curious. I think our kids are on the right path. In my mind, it’s because my wife and I know our children. We continually reflect and evaluate, both them and ourselves. We monitor their progress and adjust where necessary. Sometimes we get it real right and other times we get it wrong, but we learn from it all. As brilliant as I may think I am, I’m not doing anything different than what my children’s teachers do on a daily basis, when we allow them to, that is. As a father, I demand the right to do as such and what baffles me is, why would I not extend this courtesy to the very people that I have entrusted my children to for the majority of the day? Why would I not empower them in their role as a member of the team charged with bringing my child to maturity? Think for one minute, would you scrutinize your spouse in the same manner we scrutinize our teachers? Would you deny your spouse resources like we deny our teachers? Would you not consult with your spouse on their observations and insights before making pronouncements? We need to step back and realize that providing for the people who care for our children is not putting adult interests first, but in fact, is protecting the interests of our children. There’s a saying that goes, “That if momma ain’t happy, ain’t nobody happy” that never fails to elicit chuckles. The best humor is always rooted in truth. We need to make sure our teachers are happy and feel supported, so they can focus on ensuring that our children live better lives. That’s a child centric-policy. 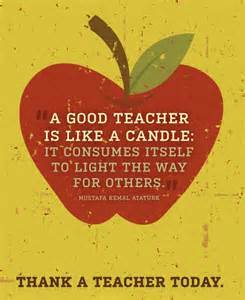 Teacher appreciation week is May 4th through May 8th this year. Instead of offering coffee mugs and trinkets, why don’t we ask what they would appreciate. I’m taking the year off of teaching and, among other realization, I have really seen just how exhausting the job is when in session. I’m not sure exactly how to solve this; I think much of it comes from just a primal urge to improve all the lives we see. Still, I don’t think enough thought is given by administration in making sure to eliminate unnecessary tasks and not adding new burdens that won’t do much. For example, I’ve seen at my school principals having teachers switch preps for little to no reason. It’s like they don’t realize that an entire years worth of lesson plans is, well, time consuming. Some ideas to take care of teachers better: be thoughtful about new technology expectations, limit preps as much as possible, and bring back the scan tron (just kidding).